And I thought we've got it bad in Lebanon. Apparently, in China its far worse. 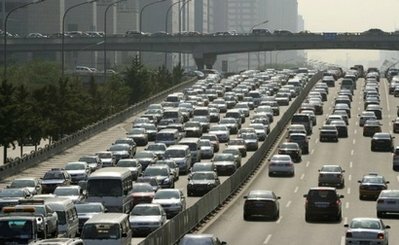 According to Associate Press on Monday, thousands of cars were stuck on the road in a 100-kilometer (62-mile) traffic jam leading to Beijing that has lasted nine days. "The Beijing-Tibet expressway slowed to a crawl on August 14 due to a spike in traffic by cargo-bearing heavy trucks heading to the capital, and compounded by road maintenance work that began five days later," the Global Times said. The state-run newspaper said the jam between Beijing and Jining city had "given birth to a mini-economy with local merchants capitalizing on the stranded drivers' predicament by selling them water and food at inflated prices." Traffic slowed to a snail's pace in June and July for nearly a month, according to earlier press reports. A nine day traffic jam? That is just insanity! Where did people go to the bathroom?? What a thing! I would never want to drive again! Makes driving in Beirut seem like a Sunday stroll!